For this dish, I only used 2 whole dry chili peppers to impart some heat but adjust it to your tastes. You can even omit the peppers all together, though it won't be traditionally spicy for General Tso's. Chicken, beef or even shrimp can be used as well instead of pork, as the sauce works nicely with these too. 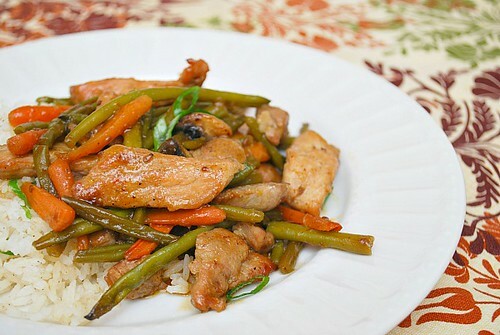 In a small bowl, prepare the sauce by combining the cornstarch with the wine, vinegar, sugar and soy sauce; set aside. In a skillet over high heat, add 1 tablespoon oil and in small batches, sauté the seasoned pork until cooked through. Transfer to a plate and set aside. In the same skillet over medium high heat, add another tablespoon or two of the oil in the wok. Add the pepper pods to the oil and stir-fry briefly, awakening the aroma but not burning them. Add the garlic, onions, carrots and green beans to the skillet and sauté until cooked through. Return the pork to the wok and stir-fry until warmed through. Add the sauce-mixture to the wok, tossing over the heat until the sauce caramelizes into a glaze (1-2 minutes). Serve immediately over rice or noodles. So very tempting, looks super delicious! I love spicy, but we've really had to dial it down because the kid doesn't. I'm looking and planning to cook a delicious breakfast for me tomorrow. I think this interesting recipe is the perfect breakfast for me. I will definitely copy your recipe. They prepare the sauce for long time, thank you for sharing.